South African ballet dancer Sibahle Tshibika featured in documentary "Ghetto Ballet"
Atlanta, Georgia (CNN) -- A South African ballet dancer from a poor township outside Cape Town has been given the chance to train in the United States -- all because of a documentary film, and an email from a caring viewer. "Ghetto Ballet" is a documentary that chronicles the lives of four young ballet dancers living in one of the poorest towns on the outskirts of Cape Town, South Africa. The film shows the dancers vying for two coveted spots in a local dance company that could be their ticket out of poverty. The film's director, Jeremy Simmons, told CNN he felt compelled to tell their story. "The kids were amazing," he said. "I knew after that first day that these kids would speak to a broader audience. They had incredible personalities; they were so open and honest and talented. I was blown away." One of the four dancers featured in the movie was Sibahle Tshibika. In the film, she is seen failing to make the cut for the dance company -- the end of her dream, or so she thought. I was so hurt inside and I thought I would never be able to be a dancer again. "I was hurt, and I thought that was the end of me," Tshibika told CNN. "I was so hurt inside and I thought I would never be able to be a dancer again." But after the film was recently screened on the HBO channel in the United States, viewer Rosemary Ringer was so moved by Tshibika's plight, she wrote to her local ballet company asking them to take up Tshibika's cause. "After watching it, I was so overwhelmed by the circumstances of the dancer, Sibahle, and the environment she was raised in," Ringer told CNN. "She lived in the shanties, the poverty-stricken shanties, but she had a desire far beyond the reach of her environment. "I felt compelled to e-mail Atlanta Ballet and expressed to them that if they could be so kind, would they please outreach to Sibahle and the producer and bring her to the United States." That email prompted Sharon Story, the head of the Atlanta Ballet's Center for Dancers, to watch "Ghetto Ballet." After seeing the documentary, she offered Tshibika a full scholarship. "I watched it and I knew immediately that I wanted to invite Sibahle to Atlanta for the summer for our summer program," Story told CNN. "She has so much passion and so much spirit and determination that I wanted to give her another opportunity." For Tshibika, it was a once-in-a-lifetime chance. "I was excited to know that there are people who are willing for me to continue dancing and I'm really thankful to them for what they did," she said. After making the long journey from South Africa to Atlanta, Tshibika said initially she was nervous and tense, but knew she had to push herself because the of the school's high standards. Right from the start, Story was impressed with Tshibika's commitment. "When she arrived, I knew who she was immediately, and we hugged immediately," said Story. "So she showed up at nine o'clock in the morning the next day and did the full day, no problems. So I was very proud of her." After a recent screening of the film, an emotional Tshibika was able to thank Ringer for the part she played in helping her accomplish her dream. "I will never forget it," said Tshibika. "I'm really appreciative and thanking her a lot because if it wasn't for her writing that letter, maybe I wouldn't be here in Atlanta." The greatest lesson that Tshibika has learned, perhaps, may not have come from the dance floor. "I hope she takes out of this experience that she can do it," said Story. "If this is a desire that she has, there are many opportunities. That once a door closes, you have to look for the other door; that there always will be another door." 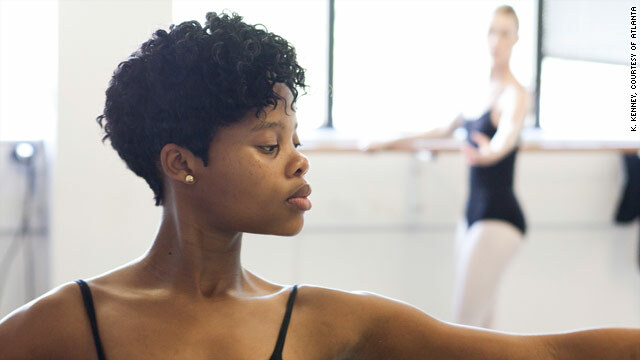 Tshibika will perform with Atlanta Ballet before heading back to South Africa to finish school, and Atlanta Ballet has invited her to return to continue her training. "If you believe in something, you should stick on it and be sure that one day it's going to happen -- and if it didn't, don't just give up," said Tshibika. "Just tell yourself you're going to make it."